Players looking for a high quality professional instrument will have many more options to choose from during the month of July this year. Once again, Atelier Puglisi will play host to AUSSIEbition, an exhibition of contemporary made violins, violas and cellos from Cremona. Makers include: Roberto Cavagnoli, Barbara Piccinotti and Daniele Ciaccio as well as a fine selection of bows from the renowned Emilio Slaverio. These instruments are some of the finest from these celebrated luthiers and a wonderful opportunity to try and compare these great works. To make an appointment, please contact Mietta or Benedict on (03) 9853 9525. 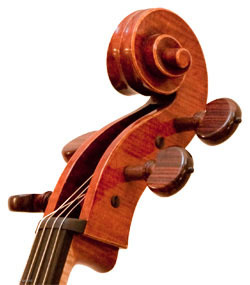 A superb professional Cello from Cremonese maker Roberto Cavagnoli. Cavagnoli graduated in 1993 at the international School of violin Maker “Antonio Stradivari” in Cremona under the guidance of M° Giorgio Scolari displaying great talent for carving wood. After studying, he spent many years of training in Angelo Sperzaga’s workshop, where he improved manual dexterity and style on classical Cremonese models with particular attention for brush – painting. Between 1998 and 2000, he worked in M° Barbara Piccinotti’s workshop. He took care of clean lines, imprinted a sound research and he developed a personal style. In 2001 he received an offer overseas. So, he went in Australia where he had the opportunity to work with M° Jams W. Robinson. He made his own the necessary shrewdness for a fine instruments set – up. He deeper the sound research. In 2003 he participated at 10th Cremona Triennal with a viola and cello with excellent results. In 2004 he won a Silver Medal for the cello tone at the V.S.A. Competition in Portland (Oregon) U.S.A. In 2005 he participated at the Mittenwald Competition with a viola. In 2006 he won the third prize with a cello at the XI° International competition “Triennale” in Cremona for the personalized work and for the excellent quality of the sound. In the same year he participated at Poznan Competition. He is a member of the "Group of Professional Violin and Bow Makers", the Consurzium “A.Stradivari” of Cremona and V.S.A. 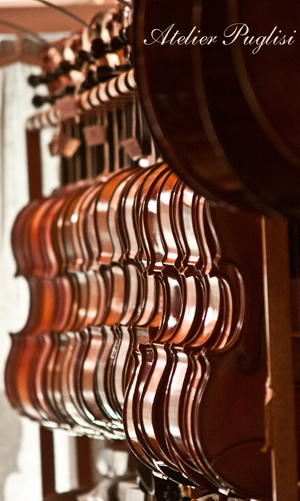 Today Roberto works in his own workshop in the centre of Cremona, via PECORARI 5, and he makes violins, violas and cellos, following the antique Cremonese tradition. For further information or purchasing details regarding this instrument, please contact us.